Add some WHOA to your Bronco's get up and go with the WILD HORSES front disc brake kit. It will work on the Dana 30 or the Dana 44 so if you upgrade to a 44 in the future, your brakes will work on the new front end giving you noticeably improved braking characteristics over the stock four wheel drum set up. All new parts. Want to add some WHOA to your Bronco's get up and go? You will be happy to know that the WILD HORSES front disc brake kit will work on the Dana 30 or the Dana 44. This means you can install the brakes on your 30 and if you upgrade to a 44 in the future, you can just transfer the brakes over to the new front end. You will have noticeably improved braking characteristics over the stock four wheel drum set up. Our kits use ALL NEW parts, nothing is used or rebuilt and there are no added core charges. 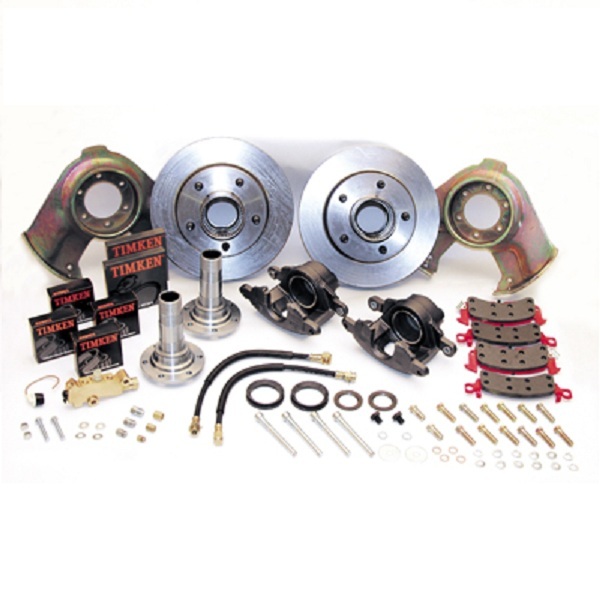 The Standard Kit comes with caliper brackets, calipers, pads, spindles, assembled hub and rotors with bearing races installed, hoses, hardware and instructions. The Standard with Bearings Kit is the second option. 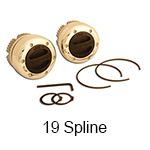 The Deluxe Kit consists of the standard kit and also includes the pressure valve and fittings. The Super Deluxe Kit (as pictured) includes the pressure valve and fitting kit with wheel bearings. So, you may be wondering why wheel bearings are optional. 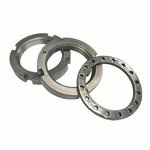 You will be glad to know you can use the same wheel bearings you have now. 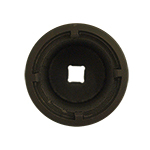 We recommend you replace the wheel bearings at the time of the disc install unless you have replaced them recently. This is one of the best disc brake conversion kits for the Bronco front brakes yet! I have done several conversions and this one is the top choice. 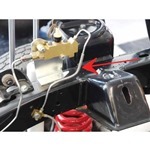 Comes complete with everything needed and is easy to install, provided you have some fair mechanical skills. I was able to use the factory aluminum wheels that cam on the Bronco, other s sell kits where this is not the case. Well done Wild Horses 4X4. This is an awesome product. Shipment was quick and Wild Horses was very helpful with my questions. This kit is the single best upgrade I have done on my Bronco. It makes daily driving much easier and safer. I would strongly recommend this kit to anyone looking to upgrade their front end in any way. WH makes this kit even easier to install with their strong customer support (I emailed Paul on a Saturday morning and he called me immediately to help me resolve some questions). I could not be happier! Great product. Bolts right in and easy to install. I would recommend this kit to anyone. Clear and detailed instructions, simple installation !!! kit had everything I needed, bearings, seals, hoses, it was perfect! The one thing I would say it needs is more pics(as everyone else stated). Great kit! Everything needed is there. 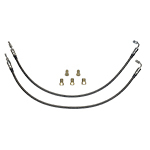 Don't forget to order new brake hoses from master to prop valve. Really great product. Best upgrade to my 72 ive made so far. Awesome. It worked great. Highly recommend this kit. I have a 69 with the d30 upfront. Everything fit great and had no issues. Bronco stops far better now and straight. I have rear drums and a booster. I also purchased the prop-valve bracket. It put it in the perfect location. The kit was awesome - everything I needed was included. Installation was straight forward and simple. Could not be more satisfied! Really enjoy the stopping power of having front disk brakes. Kit was easy to install, however It would be nice to have more pictures with instructions. Kit is complete but you may want to consider replacing outer axle seals and U joints while you are in there. Better to buy ahead of time so your not running around looking for parts. This kit is amazing. I had never even taken a locking hub off before this. After some initial hick-ups because of inexperience, this thing went on like clockwork. To the rookies like me, just take your time and after one wheel the other side will go on in an hour or less. Doesn't even feel like im driving a bronco anymore! I thought the Kit was very inclusive and the only thing extra I needed was the wheel bearing Grease. I have a little trouble with my ordering information but Wild Horse's Great customer service cleared it up promptly by giving me a call and sending an Email. I got everything very quickly and Installation was a breeze with the Instructions. So far it's been very straight forward. Only 1 phone call to WH, and it was answered right away. Quality of the parts are very good and I should know since I'm a machinist. This kit has everything needed to simply bolt on and go. No need to look up multiple part numbers or search junkyards. This kit can be added to your Bronco in a weekend in the garage. Very nice kit - quality parts. It would be nice to have improved instuctions with some photos showing steps and completion. The customer service was, as always, great. I also added the Power Booster and Bracket - another great product. Unbelievable difference in the stopping power. I highly recommend upgrading. I agree with the other reviewer on adding photos to the instuctions. Once orientation was figured out the process was simple and went smoothly. A nice weekend, driveway install. Very nice kit - quality parts. It would be nice to have some photos on the web site to go along with the instructions. The customer service was great. That's what keeps me coming back. I also added the power booster and Bracket - another great product. Huge difference in the stopping power. Anybody thinking of upgrading to disc brakes, I highly recommend it.